Not just an outstanding seasonal ornamental or accent plant, variegated gat grass provides vitamins and fibre for your cat's diet. 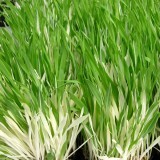 Edible for humans, too; used just like wheatgrass, variegated cat grass can be freshly juiced or dried into powder. ..